As teeth begin to shift over time, the bite changes. This can lead to excessive wear and tear on the teeth and ligaments. Our approach to your delicate situation and unique oral health is something we are passionate about. We want to ensure that you will have a positive experience with our team and approach. After a comprehensive evaluation, we will work together closely to develop a treatment plan that targets your overall goals. With our intimate setting, you can rest assured that our focus is solely on you when you visit our practice. The preferred method of replacing a missing tooth is with an implant. Replacing a missing tooth is essential to avoid over-eruption. This is where the tooth on the opposing side loses its natural structure needed to hold it in place. This leaves room for the opposing tooth to slide into the void created from the missing tooth, thereby altering your bite and exposing the healthy tooth’s root. An implant is recommended over a bridge when possible because it integrates into the jaw and does not disturb the surrounding teeth. Full restoration typically requires 3 months of healing time and can last a lifetime. A complete replacement tooth is known as an implant crown. It is even attached to an implant with a connector called an abutment. We will design a custom fitting tooth that matches the color of your teeth. The crown retains structural integrity by keeping opposing teeth in alignment and cosmetically helping restore confidence with a healthy and full smile. The alignment of your teeth is important for a proper bite. The way your upper and lower teeth rest when closed is known as occlusion. Malocclusion occurs when there is a misalignment of the bite is caused by the teeth coming into the mouth incorrectly or wear and tear that has changed the way the teeth come together. Malocclusion allows excessive destruction of the teeth and will cause you to need much more dentistry in your lifetime than someone who has an occlusion that helps distribute forces properly throughout the mouth. It is important to fix malocclusion before developing more serious dental and health issues. If we find cause for concern, we will work with you to find the right course of action. If you suspect malocclusion, come in as soon as possible so we can prevent further damage and properly restore your bite. Dental Reconstruction is typically a collaborative event amongst a network of specialists in the field of dentistry and sometimes it may even include other specialists outside of dentistry. Just like when a house is outdated and worn, people will rebuild their houses. We can renovate or reconstruct someone’s teeth in the same way. Have you become dissatisfied with your smile because your teeth are crooked, worn or eroded? Do you want the youthful smile of your 20’s back? Dr. Bruno is well-trained and able to help you plan a smile that you will love! If there is something specific you want, be sure to bring in some pictures so you can discuss what your goals are with Dr. Bruno. If you have lost all or most of your teeth, you know that chewing and digesting has become pretty difficultand may also make you feel self conscious. 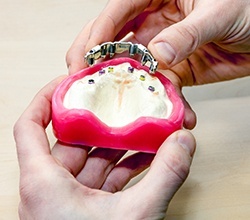 At Bruno Dentistry, we are able to take custom molds of your mouth so that we can make a pair of dentures that can give you back your smile and allow you to chew. These dentures are formed from the custom molds and they are pink acrylic with white acrylic teeth set in them. We’ve come a long way in dentistry in the last 100 years. No longer do patients need to deal with dentures that rub on tissue or fall out of their mouths. Dr. Bruno is able to create implant supported dentures for her patients which allow patients to have a more natural and comfortable solution to regain their chewing ability and smile. The dental implants anchor the denture in place allowing a more precise and sturdy fit. The implants keep the denture from pressing too hard on the tissue and causing sore spots and they help maintain the jaw bone instead of having it slowly regress over time. Implant supported dentures are the best solution for edentulous (people missing multiple teeth) or partially edentulous patients. Dr. Bruno looks forward to helping you achieve a beautiful, healthy smile that lasts for years. Call us today to learn more about our prosthodontic services and how we can help rejuvenate your beautiful smile!